Petulant, petty, puerile, cowardly yet arrogant, incredibly vain, and prone to violent temper tantrums, struggling would-be actor Caesar Denovio is once again the "Ren" to lovable slob Otto's "Stimpy" in their latest laugh-packed horror comedy, CAESAR AND OTTO'S PARANORMAL HALLOWEEN (2015). As the hapless half-brothers, Dave Campfield and Paul Chomicki first hit the screen in a reality TV spoof that was aptly titled CAESAR AND OTTO. After that, they veered into slasher territory with CAESAR AND OTTO'S SUMMER CAMP MASSACRE and CAESAR AND OTTO'S DEADLY XMAS while paying homage to classic horror in the short films CAESAR AND OTTO IN THE HOUSE OF DRACULA and CAESAR AND OTTO MEET DRACULA'S LAWYER. Here, they're back in action facing more supernatural perils in their most fast-moving mashup of the horror genre yet. 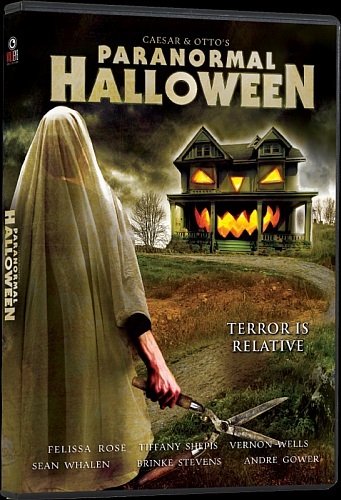 The story starts off running with a hysterical spoof of HALLOWEEN that SCARY MOVIE wishes it had thought of. In addition to the ghastly sight of Caesar and Otto dressed in drag so that they can score high-paying babysitter jobs, we also get a jab at Dr. Phil thrown in for good measure. And this is before the credits have even rolled. Before long the boys find themselves house-sitting for highly unpopular governor Jerry Grayson (series stalwart Ken MacFarlane, THE MILLENNIUM BUG) in a dream mansion that seems too good to be true. What the governor fails to mention is that it's haunted. I mean really, really haunted. This is just the jumping off point for director and co-writer Campfield to start lampooning every fright flick from THE SHINING to PARANORMAL ACTIVITY to INSIDIOUS to THE AMITYVILLE HORROR. THE EXORCIST is given its due when the boys' roguish dad Fred (Scott Aguilar) shows up and gets possessed (actually, it turns out he's just extremely drunk) which draws the questionable involvement of priests Sean Whalen (LAID TO REST) and Deron Miller (SUMMER CAMP MASSACRE, DEADLY XMAS). As usual, rank silliness is elevated to a sort of rough-hewn art form in this installment of the ongoing series, with sharp editing and a cartoon-like pace giving it the giddy feel of a live-action Looney Tune. The gags are non-stop with barely a breath between them, and most of them score (if not a guffaw, then at least a knowing titter). Production values, while still not quite on the level of a Spielberg film, are the most lavish for an entry in this series. This is probably Dave Campfield's best work as a filmmaker so far (although his first film, the serious thriller DARK CHAMBER, continues to impress). Besides its inventive script, the film's main strength is a cast that many indy filmmakers would die for. Scream queens Tiffany Shepis (BONNIE AND CLYDE VS. DRACULA), Debbie Rochon (THE THEATER BIZARRE), and Brinke Stevens (JONAH LIVES) are on hand along with SLEEPAWAY CAMP's Felissa Rose and Beverly Randolph of RETURN OF THE LIVING DEAD. Vernon Wells (THE ROAD WARRIOR's iconic "Wez") shows up as an axe-wielding psycho in a creepy old 8mm film the Denovios discover in a hidden room. Rising stars JamieLee Ackerman and Josephine Iannece make an impression as the mansion's mysterious cook and gardener. And as the titular non-heroes, Campfield and Chomicki just might be the greatest comedy duo since Abbott and Costello. The DVD from WildEye Releasing is in anamorphic widescreen with 2.0 sound. No subtitles. A wealth of bonus features include two commentary tracks (one with Campfield, Ackerman, and Iannece, the other featuring Chomicki and other cast and crew), a gag reel, a tribute to the late Robert Z'Dar, trailers, behind the scenes videos and podcasts, and the delightful "Son of Piggyzilla" trilogy of shorts about everyone's favorite giant carnivorous guinea pig. All the slapstick gore and goofy thrills you expect from a Caesar and Otto flick, and then some, are lurking in the delirious CAESAR AND OTTO'S PARANORMAL HALLOWEEN. So check it out, but beware--you just might die laughing.